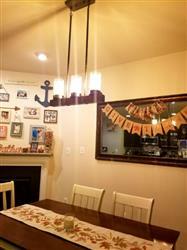 It updates a plain kitchen into a rustic farmhouse-inspired space with this 3-light linear chandelier. This kitchen island light features an alluring clear and seeded glass shade. Looks great in our dinning room! Would recommend!